RRB ALP CBT Stage 2 2018-19 Exam result has been declared on 5 April 2019. ADDA247 and team send greetings to all the selected candidates in RRB ALP CBT Stage 2 Exam who are qualifying for RRB ALP Computer Based Aptitude Test (CBAT) to be conducted on 16 April 2019. The final exam of CBAT instills the Test Battery consisting of five tests which are demonstrated as Memory Test, Following Directions Test, Depth Perception Test, Test of Power of Observation & Perceptual Speed Test. RRB ALP final stage exam is mandatory to successfully plunge into the Document Verification Procedure. Also RRB ALP CBAT Exam has its own modus operandi to which a majority of candidates aren’t insightful enough. The candidates are bound to secure a minimum T-Score of 42 in each test of the test battery to qualify for the post of Assistant Loco Pilot which makes it compulsive for all the RRB ALP CBT Stage 2 selected candidates to encompass themselves with a felicitous mode of learning to have a comprehensive cognizance of the final stage exam for RRB ALP 2018-19. 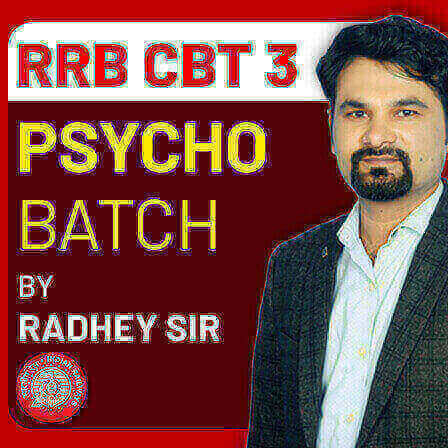 And ADDA247 fulfills your expectations with RRB CBT 3 Psycho Batch By Radhey Sir (Live Classes) available at just Rs. 1,199. Use Code LIVE10 to get 10% discount for admissions before the batch starting date. If a secure job in Railway is your priority, RRB CBT 3 Psycho Online Batch By Radhey Sir (Live Classes) must be your intact choice to face the final stage of RRB ALP 2018-19 Exam to come off with flying colors. 10 hours live classes will completely prepare you for RRB ALP CBAT 2018-19 Exam leaving no trace of doubt in your mind. Hurry up before all the batch seats get occupied and you lose out on the best live class facility to make you sail through RRB ALP CBAT 2018-19 Exam.